Published by RMC Media Photography by David Nash, The Electric Eye Photography. Verveine is a work of visual and culinary art inspiring on multiple dimensions. A stunning representation of the inner workings of the mind of the talented but humble chef and author, David Wykes. His innovative and fresh approach to cooking feed each exquisitely produced page. To create the book, David has translated numerous notebooks crammed with flavours and ideas into recipes and reference pages to stimulate creative minds. “This book is about expanding horizons. It’s a fundamental tool to provide the scope to think differently about food and to try combinations you might never have thought of” explains David Wykes. Divided simply into ‘Savoury’ and ‘Sweet’ both sections feature recipes, pairings and building blocks with two further subsections dedicated to bread and petit fours. The book is an education which will equip the reader with a culinary toolbox of skills to fuel their own creative journey beyond these pages. The striking imagery is a glimpse into the level of presentation diners experience at Verveine, David’s restaurant in Hampshire. In the book, the complex is made simple in the way that the recipes are written with each element of the plate detailed separately. It is then for the reader to pluck elements and combine them inspired by the pairing suggestions. 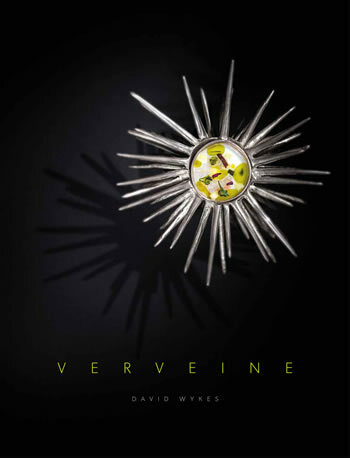 Verveine is more than a cookbook and with just 1,000 copies produced in the initial print run it is going to be a race to get a copy ahead of Christmas. David is the chef/patron of the award-winning fish restaurant, Verveine in Milford-on-Sea in Hampshire. The 28-cover restaurant is situated at the back of a fishmongers, it focuses on seasonal and innovative cooking. Combining the best ingredients with creative thinking to produce playful and delicious dishes. The restaurant has been recognised consistently by the Michelin Guide, Good Food Guide, Hardens Guide and the AA, and has been featured in the Sunday Times’ Top 100 Restaurants as well as winning several county awards for cooking and hospitality. A popular local and destination restaurant, Verveine offers its guests and informal atmosphere whilst serving them beautifully crafted dishes.